First published in 1912, Bennett's New Latin Composition remains a highly regarded, widely used composition text for both high schools and colleges. Part I is based on the works of Caesar with illustrative samples drawn directly from his own words. Parts II and III concentrate on Cicero. The profession long looked forward to and appreciates the reprint of Bennett’s New Latin Grammar. Now it will be wonderful to have the companion piece, Bennett’s New Latin Composition. The composition book in one section emphasizes Caesar and in the other, Cicero; it includes additional work in continued prose and oral exercises as well as a comprehensive parallel vocabulary. 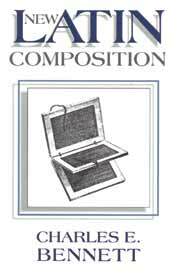 The two books form a complete set for a course in Latin prose composition. An excellent guide to prose composition, focusing on Cicero and Caesar as models.